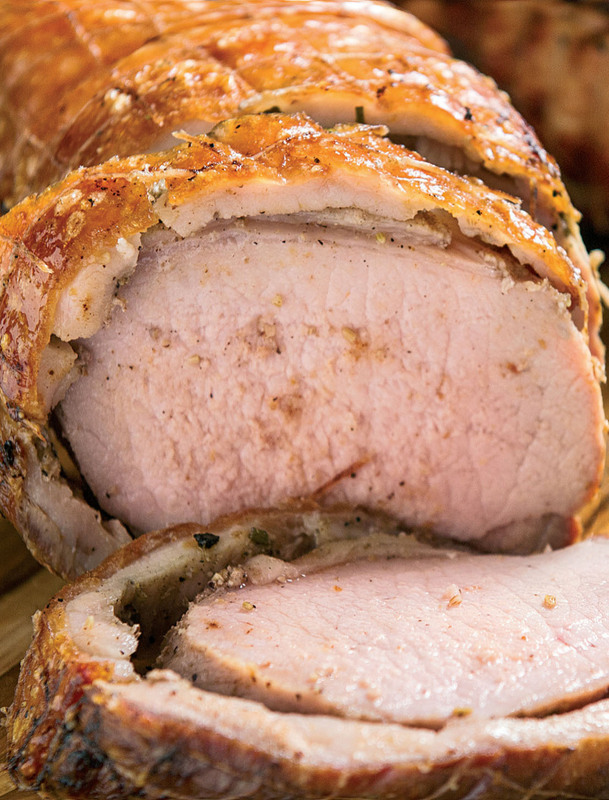 Porchetta is a savory, protein-packed, and moist boneless pork roast of Italian culinary tradition. Porchetta has been selected by the Italian Ministry of Agricultural, Food and Forestry Policy as a prodotto agroalimentare tradizionale (“traditional agricultural-alimentary product”, one of a list of traditional Italian foods held to have cultural relevance). In Philadelphia and the surrounding area, the dish is usually referred to as simply "roast pork," "roast pork sandwich," "Italian roast pork," "roast pork Italian," "roasted pork," or "porchetta." Philadelphia cuisine is noted for its sandwich form of porchetta, usually served on an Italian roll and often with broccoli rabe instead of spinach and most traditionally with sharp provolone. Porchetta is a thing of complete joy. You can cook this as the classic centerpiece of a big feast with all the trimmings, or serve it up on a board with a carving knife at a party with buns, condiments, salad and gravy for dipping. 1) Get your meat out of the fridge and up to room temperature before you cook it. 2) For the stuffing, peel and finely chop the onions, finely slice the pancetta, then place in a large frying pan on a medium-high heat with 6 tablespoons of oil, the butter and fennel seeds. Cook for 5 minutes, stirring regularly, while you finely chop the chicken livers and herb leaves. 3) Stir the livers into the pan, followed by the herbs and 50ml of wine. 4) Roughly chop and add the dried fruit, along with the pine nuts. Cook and stir for 5 minutes, then remove from the heat and leave to cool. 5) Finely grate over the Parmesan. 6) Toast the breadcrumbs and use your hands to mix them into the cool stuffing. 7) Place the pork loin on a board, skin side down, open it out and push it down flat. Season generously with sea salt and black pepper, then pour over and massage in half the Vin Santo. Scatter over the stuffing, pour over the remaining Vin Santo, then roll up the pork, patting on and compacting the stuffing as you go. 8) Sit it with the seam underneath and tie with butcher’s string to secure it, then score the skin and into the fat with your knife. Season generously and rub all over with oil. 9) When you’re ready to cook, preheat the oven to full whack (240ºC/475ºF/gas 9). 10) Wash the carrots and place in a large roasting tray. Sit the porchetta on top, then pour in 500ml of water and the remaining 325ml of wine. Place in the hot oven for 30 minutes, then reduce the temperature to 180ºC/350ºF/gas 4 and leave to cook for 4 to 5 hours, or until the meat is really tender, basting now and again. 11) Remove the porchetta to a board to rest for at least 30 minutes. 12) Meanwhile, place the roasting tray over a medium heat on the hob. Skim away most of the fat from the surface into a jar, cool, and place in the fridge for tasty cooking another day. 13) Stir the flour into the tray, mashing the carrots and scraping up all those gnarly bits from the base. 14) Pour in the stock, and simmer until the gravy is the consistency of your liking, stirring occasionally. 15) Strain the gravy through a coarse sieve, pushing all the goodness through with the back of a spoon, then season to perfection. 16) Carve up the beautiful porchetta, and serve it as you wish. What to Serve with Porchetta?